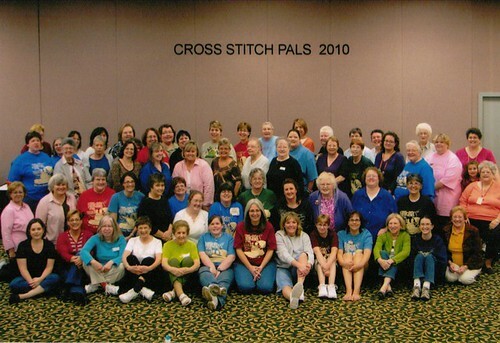 Here is the group picture from Pals (I'm in the bottom left corner). And here is a picture of a shaker tray I got. I just couldn't resist it! Now I have a place for all of Tanya's beautiful hand-painted accessories. Amy told me she has one more left and will be getting more. I started Jenny Bean's Halloween Sampler last night. I meant to take it with me to Myrtle Beach, but forgot it. I know I won't finish by Halloween, but I've been wanting to stitch it for so long that I decided to start it anyway. I'll take a picture of my progress tomorrow. Love your shaker tray and fun picture!!! Great picture! Lucky you to nab that shaker tray too! No wonder you couldn't resist that Shaker tray! It's wonderful. I'm glad that you had such a great time. These retreats are really something special. Your shaker tray is awesome! Loved your pics and all your exchanges. Looks like so much fun!!! Pretty tray! Love all the painted pieces! Nice group shot! I even saw someone I know that used to live here! Next year I'll be in that photo, too. I promise. I've already told dh that I'm heading east in Oct. Love the tray. What a great group!!! 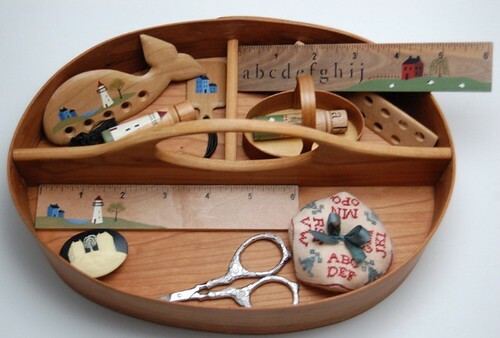 Love that tray - I have one like that too - but you have the greatest goodies to fill it!! I may have to get some of those goodies too! Love the shaker tray. I especially love the miniature one! Love that Shaker tray - great buy! The tray is gorgeous and I love the handpainted things you have in it. Very cute! Looks like you had lots of fun!! Love your finish...the colors are gorgeous. Can't wait to see your next stitching project! Have a great day! OK, I'm going to have to get one of those Shaker trays, because I'm totally jealous of yours. LOVELY display!! It was lots of fun - yeah - I couldn't resist one of those trays either! Great pictures!